Gently cleanse and moisturize dry, itchy skin with Aveeno Skin Relief Body Wash. This fragrance-free body wash is made with soothing oat and is gentle enough for sensitive skin. Its unique formula is designed to work with your skin to remove dirt and impurities without disrupting your skin’s natural moisture barrier for skin that is soft, smooth and healthy-looking. 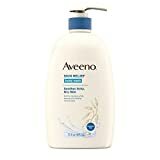 From the dermatologist-recommended brand for over 65 years, this moisturizing body wash is allergy-tested, soap-free and dye-free, and is suitable for daily use.AVEENO uses the goodness of nature and the power of science to keep your skin looking healthy and feeling balanced. Follow with Skin Relief Lotion to lock in moisture for 24 hours. Hypoallergenic.